Tom Volk's Fungi, including mycology,molds, morels, fungus, IAQ, Indoor Air Quality and much more. 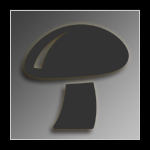 The full Species Ide4ntification of All Things Shroomy is now fully open for viewing. 67 Species Descriptions (more than 2,500 photographs to full screen height) and of those, four which do not get one inebriated but are often picked and mistaken as the good ones. Heres a nice "little" bank of images to browse. Doesnt have everything, but does seem to have a nice selection and some species details when available to author attached to the pic's. Nice site, some supplemental updates for a few commonly used field guides, Pic's, Descriptions, links, resources, the whole Sha-bang folks. One main focal point here is their collection of Fungal-photo galleries from many, many, many different Myco clubs and individual enthusiasts worldwide.